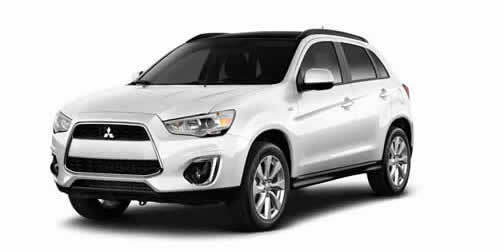 Mitsubishi's entry into the crowded entry level SUV/Crossover market is a decent vehicle made even more so for the 2015 model year. The RVR (called the Outlander Sport in the U.S. market) now sports a mid-year added 2.4 litre four banger for the GT and SE Limited versions, adding a bit more oomph compared to the base two litre version that's still available on the ES, SE 2WD and 4WD models. Mitsubishi says its decision to offer the two power plants was born from the engineering team's desire to "strike a balance of fuel efficiency and power - as well as offering a broader choice to consumers." So it is that the larger engine puts out 168/167 horsepower/torque compared to its little brother's 148/145, and who can argue with added get up and go, especially considering it still gets decent fuel mileage of 8.9 litres per 100 km in its all-wheel drive (or, in Mitsubishi lingo "all wheel control") livery. The two litre, by the way, is rated at 7.3 l/100 km. 2015 marks the fifth year the RVR has been available in Canada; the vehicle was company's top seller in the Great White North for the 2013 model year and very nearly repeated that in 2014, though it was beaten out by the Lancer sedan family. It snagged the honour in the U.S. that year, however. And it's a decent vehicle, which also comes with an excellent warranty of 10 years or 160,000 km on the power train, a five year/100,000 km new vehicle warranty and five years, unlimited mileage roadside assistance. Seems the folks at Mitsubishi are confident enough in their product that they don't think they'll need a fleet of tow trucks on hand for customers who find themselves on the side of the road. Mitsubishi says it's the best warranty on the planet, which undoubtedly helped lead to the company's new brand statement "Built Better, Backed Better." Since I only had the new RVR - the top line GT 4WD model - for a week, I wasn't particularly surprised that it didn't leave me stranded and while it isn't my favourite vehicle in this segment I can certainly see why people would choose it. It's pleasant to drive (well, the sample was as pleasant as a CVT-inflicted vehicle can be), offers a good set of features and a competitive price: the sample only had one option ("pearlescent" paint worth $160) and came in, sans extra charges and taxes, at a reasonable $29,398. Mitsubishi says its all wheel control system continually monitors the road ahead to improve handling - not that other such systems don't. But the RVR gives you a manual control to switch between 2WD/4WD/4WD lock, which lets you choose whether to keep the RVR as a front wheel drive vehicle, to up your fuel economy, or you can opt to let the robot brain do it for you, like it does in many other vehicles in this segment, choosing two or four wheel drive as it deems proper. The 4WD lock setting is for when things get really hairy on the road (well, maybe "gravelly or snowy" would be more apt than "hairy"); it keeps the car in 4WD all the time. The RVR is a good looking vehicle, and Star Wars fans may get off on its Darth Vader-like grille. Inside, the mostly black interior is broken up by silver "aluminum-ish" accents and the controls are laid out logically and work well. You can choose, depending on the trim level, from a five speed manual transmission (why not a six speed?) or a "Sportronic" CVT that's about as much fun as most (though perhaps a tad quieter) and comes with paddle shifters you can use to pretend it isn't a CVT. The downside to the paddles is that they're mounted on the steering column, not behind the steering wheel, so they don't turn with the wheel. If you want to "shift" while turning, then, you may have an issue. The seats are comfortable (the rear splits/folds 60/40 per cent) and the sample had a great panoramic roof, though it doesn't open even a crack - and the button that opens and closes the blind you can use to cover the glass panel when the sun gets too overpowering feels a tad cheap. While I enjoyed the RVR overall, there were niggling little things (such as the aforementioned button and fixed paddles) that bothered me. For example, the lock/unlock button on the door handle is positioned a long stretch away for my thumb when I grabbed the handle (granted, I'm not a tall individual) and the audio volume/on-off button is on the right side of the LCD, which also makes it a long reach for some. These aren't huge deals, of course and in the case of the audio controls (other than on/off) you can partake of duplicate ones on the steering wheel. I also thought the driver's seat felt a tad, well, inexpensive, in that when I shifted position it would rock back and forth as if it weren't attached securely enough. But the soft touch materials in the cabin are fine and you can get Bluetooth and USB streaming audio and you can order a Rockford Fosgate audio system, navigation with traffic info, and more. Mitsubishi Canada's sample wore handsome 18 inch wheels, "super wide" HID headlights, fog lights, roof rails, rain sensing wipers and more. In other words, you can get it as well-equipped as the competition, which of course is as it should be. In all, while the RVR isn't my favourite model in this "cute ute" segment, there's really nothing wrong with it. How's that for high praise? Really, though, the RVR works just fine, and my quibbles came mostly from issues of personal preference rather than real design flaws (well, except maybe for the paddle shifters' mounting). But if you can get around that stuff, you'll find a good vehicle, with good specifications and features, at a good price. And judging by the number of RVR's I see on the roads around here, it appears plenty of people are finding plenty to like about the vehicle. And how about this? It isn't available with all the nannies - lane departure assist, adaptive cruise control, forward crash mitigation, that kind of thing - that drive me absolutely crazy. They aren't even available as options on the RVR (though you can get them on the Outlander). Thanks, Mitsubishi, for letting drivers drive.